What's next in the battle against wheat? 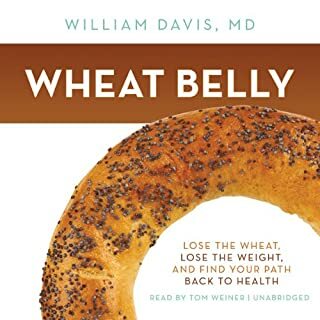 In his follow-up to the mega best seller Wheat Belly, Dr. Davis helps his listeners take command of their lives and health in the aftermath of wheat. 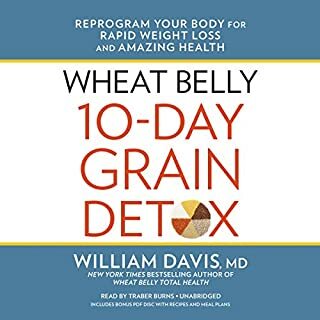 There are many strategies that will help heal the damage caused by years of a wheat-filled diet, and many of these lessons have been learned in the years following Wheat Belly's original release - lessons played out on a broad public stage with over 1,000,000,000 listeners, all participating in this grand adventure. Reordering your life after wheat is about learning how to regain full metabolic, gastrointestinal, thyroid, cardiovascular, hormonal, sleep, neurological, bone, and joint health. Understanding the strategies and putting them to use can take health several steps higher, even for those who have already had major health success without wheat. In addition to achieving better health in many different areas, life performance also improves in virtually all settings. In life after wheat, you'll feel unrestrained, unimpaired, and unstoppable! ©2014 William Davis (P)2014 Blackstone Audio, Inc. I'm 62, and have never felt better! Into my 3 week. I was in the food business for 40 years, now that I'm retired, it's hard to believe how much we bought into the hype of grains in our diet. Flare up of my eczema, gone. Craving for carbs, gone. Allergy medicine intake, gone. Inner tube around my waistline....almost gone! This book, had changed the way I look at food forever. Thank you for the truth, why has it took so long, for someone to point out the facts, in a detailed, and informative way? No wonder, why we're seeing our kids so unhealthy these days, it's really sad. Why Is There No PDF? 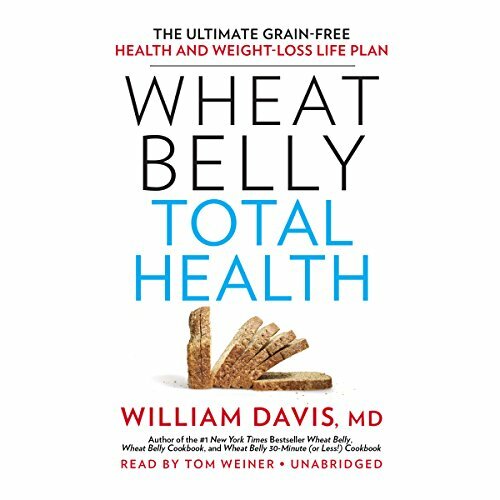 What would have made Wheat Belly Total Health better? The narration refers to appendices, yet there is no accompanying PDF. So I'm looking at the book but I'm also going to have to buy a physical copy so I can see the necessary information. That is super annoying. This book exceeded my expectations. 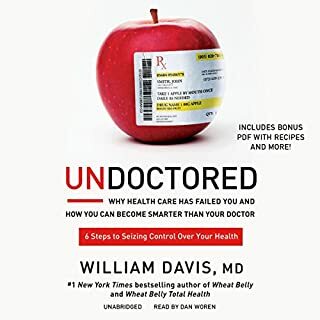 The narration was superb and allowed thought-provoking clarity.I would recommend it's reading to anyone and everyone interested in health improvement! Stuff I never knew, giving it a try. I am thankful to William Davis for making this information available. I listened to this book about a year ago when first thinking about the roll of grain in my life. Just finished listening to it a second time. I am surprised that the small changes made had greatly improved my own health since listening to Wheat Belly the first time. Why I carry 100 extra pounds is clear. I loved health whole grains - especially WHEAT! Why science is not best "settled" by saying "all scientists agree" but rather by independent peer review of supporting data and process that purport to explain an hypothesis! Why fear of the "everyone knows it" crowd kept people believing that " the Sun revolves art the Earth" for hundreds perhaps thousands of years. It's that significant a text. However, while Dr. Davis makes understanding WHY - compelling, implementing even WHEAT FREE remains a challenge- worthwhile but still A CHALLENGE. A second star only because following the authors advice will very likely make people healthier (which is great! ), but not necessarily for the reasons the authors wants you to think. I have a keen personal and professional interest in a subject of nutrition and have read/listened to most of the popular/"best seller" stuff on the subject in additinon to more technical literature. This book was very disappointing. It is not that I disagree with the premise, but I felt that there was very little in terms of scientific backing for the authors very strong statements. A lot of flowery language bashing "the poisonous, unfit for human consumption grasses", but saying something a thousand times doesn't make it so - I want to hear more about the science. 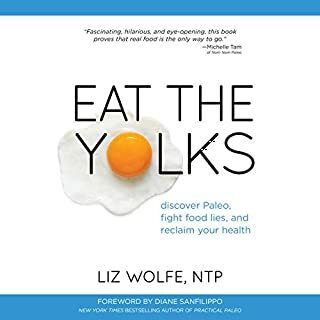 If you are going to expect the reader to change their lives drastically, you got to offer a lot more evidence to be convincing (and for someone like me who's been very firmly on a low carb/keto vagon for years, to say a prescription is drastic is saying something - it is one thing not to eat bread and pasta, it is a different story to avoid every trace of every grain in your life). Again, I am not saying the author is wrong or that his 'total health' plan is not a good one for people to follow, but I am saying that the evidence he offers does not support his conclusions. 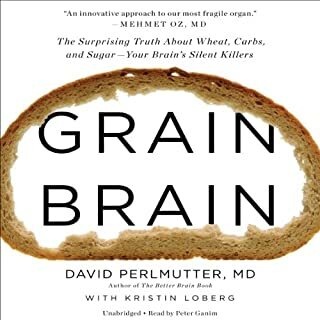 Doing something right (eating less carbs, let's say) for the wrong reasons ('grains are the reason for all your health problems') is not a good solution for our health. A more nuanced approach is required if we are to really help people get healthier. And there are many other popular books that are better written and better scientifically supported. And I thought the original WB was good...great book! My need for this book was based on looking to lose weight...the WB series reveal truths that EVERYONE should read when it comes to learning about our foods and the TRUTHS! 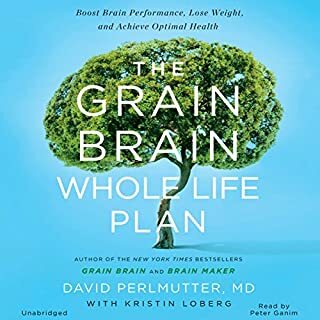 One of the best health books i have ever listened to. This book changed my life and health. it will change yours as well if you follow the guidelines in the book. Read this if you have trouble sleeping!! What disappointed you about Wheat Belly Total Health? This is a fascinating topic, one that I am very interested in, but this book is written in a very clinical way. It is very dry and the narrator was very flat. I believe there is good information in here, but picking through the kernels and trying not to nod off is challenging!! I'm super disappointed! Something for the lay person, please!! Yes, the performance was AWFUL! !